Home / Balsamic Recipes / Ravioli with asparagus and Balsamic Vinegar! Ravioli with asparagus and Balsamic Vinegar now is the right time. 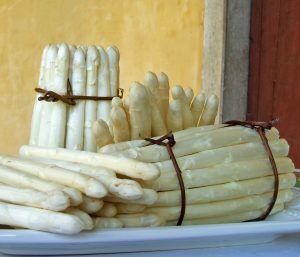 At the end of March starts the period of the asparagus! Sprouts of a herbaceous plant, which are harvested tender as soon as they emerge from the ground. If you delay harvesting they become woody. That’s another reason why their season is short! We can find fresh ones until the end of may, so why don’t we make a recipe with them when we have the possibility? That’s why today we suggest you this recipe: ravioli with asparagus and Balsamic Vinegar! First of all, on a chopping board knead the flour with the eggs and oil, and roll out a thin sheet of pasta. Clean the asparagus and leave it to soak for a couple of hours, since we need them to be soft. Cut 5-6 tips and keep them aside in a bowl with water and lemon. Boil the remaining asparagus in water and a tablespoon of lemon. Pass them through the mincer so to obtain a homogeneous puree, add the eggs, the ricotta cheese and the Parmesan cheese, so to obtain a soft compound. Therefore, you can make ravioli. Cook them in abundant salted water, drain them when al dente, toss them in the pan with butter and either the remaining thin sliced asparagus tips. In conclusion, use Traditional Balsamic Vinegar of Modena PDO to season your ravioli! To conclude we want to give you some information about asparagus: poor in sodium and rich in other mineral salts (calcium, phosphorus, magnesium, potassium), asparagus also has recognized diuretic and purifying properties. The nutritional intake is then supplemented by the good content of vitamin C (especially in the green variety) and vitamin B9.